THE KHARIF SEASON, which starts with the onset of the monsoon, is supposed to fill farmers with hope. But this year, it brought despair for JadavIndal, a 32-year-old adivasi farmer from Gollamada village in Adilabad district of Telangana. With the monsoon becoming more erratic, Indal had dug 10 borewells for assured irrigation for his cotton farm. While none of the borewells yielded water, he incurred a debt of Rs 5 lakh. Reeling from heavy debt and with no money to prepare land or buy seeds and fertiliser, he and his wife ended their lives along with their seven-year-old daughter Pushpa. On June 4, they tied their legs together with a rope and jumped into a deep dry well in their field. Their five-year-old son Jadav Shivraj survived as he had refused to accompany them. The incident took place just two days after Telangana was born. Since then, more than 100 farmers have taken their lives in the new state. One-fourth of them are from Adilabad. While the government is yet to acknowledge this, cases of suicide are being regularly lodged in police stations. “Not a day passes without news related to farmers’ suicides in the state,” says S Malla Reddy, vice-president of the All India Kisan Sabha, a farmers’ union. “Farmers usually take such extreme step after the crop fails. So cases of farmers’ suicide are reported around the time of harvesting in October-November,” says Asha Latha, state president of Rythu Swarajya Vedika, which works for sustainable livelihood for agricultural communities in Telangana and Andhra Pradesh. “This year, such reports have started coming in from the beginning of the kharif season,” says Latha. Latha points out three factors that are ailing the farmers. This year Telangana received less than average rainfall; six of the state’s 10 districts have already been catergorised as drought-hit (see ‘...and they swallowed the bait’). Irregular power supply prevents the farmers from drawing water from deep borewells and irrigate their fields. 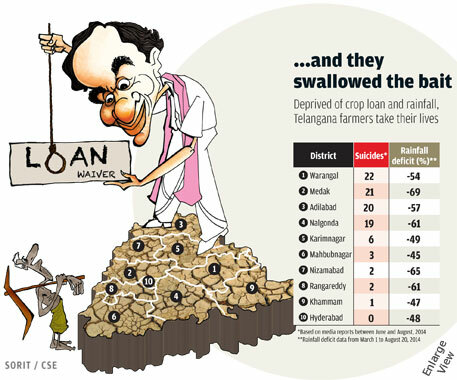 To compound their woes, the ruling Telangana Rashtra Samithi (TRS) government is yet to fulfill its poll promise to waive agricultural loans. All major political parties had promised to waive agricultural loans during election campaigns for Assembly and Lok Sabha seats in April, says G V Ramanjaneyalu of the Centre For Sustainable Agriculture, a non-profit in Hyderabad. This led to widespread speculations. A majority of farmers did not repay last year’s farm loans by its due date in April. This has made them ineligible for fresh loans, which banks disburse in May. “When I approached the bank to repay Rs 25,000 crop loan, the executives asked me to wait for the government to launch the promised loan waiver scheme and did not give me fresh loan,” says G Rajanarasimha, resident of Birkur block in Nizamabad who grows paddy, maize and sugarcane on his 2.4 hectares. Like many other farmers in his village, Rajanarasimha turned to a moneylender and borrowed Rs 25,000 at 36 per cent interest rate. Banks charge up to four per cent interest for crop loans. “Moneylenders are cashing in on this situation and are charging as much as 84 per cent interest,” points out Reddy. The ruling TRS government under chief minister K Chandrasekhar Rao did announce a scheme to waive crop loans and gold loans up to Rs 1 lakh for farmers soon after assuming charge. But the scheme was nowhere near the implementation stage till the magazine went to print. On July 19, when chief secretary Rajiv Sharma issued the order for constituting a high-level committee that would formulate modalities for loan waiver scheme, kharif season was halfway through. 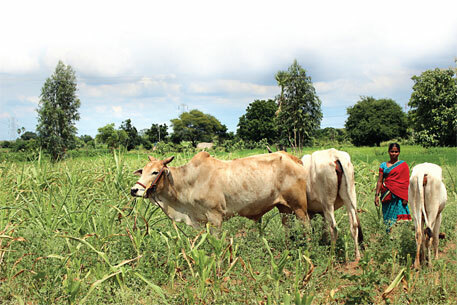 The government says waiving the loans of 3.9 million farmers will put a burden of Rs 18,000 crore on the state coffers. So it had requested RBI to reschedule last year’s farm loans for seven years. But the Central Bank, one of the banks that issue crop loans, contested the proposal. Down To Earth has learnt that RBI has agreed to delay repayment of the loans for three years in Adilabad, Karimnagar and Mahabubnagar districts alone, saying that the other districts did not incur significant crop loss in last five years. Reddy says the delay in waiving crop loan is a double whammy for farmers. They have not only failed to avail fresh loans, but have also been deprived of crop insurance. Banks usually deduct insurance premium while issuing crop loans. This year a majority of the farmers in Telangana cannot get insurance benefit if the crop fails. Last year, according to the National Crime Record Bureau, over 2,000 farmers committed suicide in the undivided Andhra Pradesh; 1,400 were from Telangana. “The number might go up this year,” Reddy warns. The TRS government holds the farmer-unfriendly policies of the previous Congress government at the Centre as well as the undivided Andhra Pradesh responsible for the present crisis. “It is the Congress government which pushed the farmers into this deep distress,” agriculture minister Pocharam Srinivas Reddy told the media on August 4. That day, farmers from eight villages in Medak district had blocked the National Highway 44 protesting erratic power supply. “It is sad that the TRS government does not own up to its contributions to the farmers’ distress,” says Ramanjaneyalu. Most of the farmers who have committed suicide are cotton growers and tenant farmers. They face losses as they invest more on seeds or grow cotton on soil unsuitable for the crop. Instead of engaging in a blame game, the government should provide them timely and good extension services, drought-resistant seeds, revive traditional tank irrigation systems, regularly supply power, fix minimum support prices taking into consideration the cost of living and rising cost of cultivation and provide good market linkage, he suggests. The Down to Earth Magazine aptly written article to question the Telangana Government is a timely attempt for discussion of the forgotten. This government's interest and concentration has been only Hyderabad in the ten districts of Telangana, KCR's son KTR announces, he will turn Hyderabad into a wi-fi zone and infrastructure development and inviting foreign investors to Hyderabad for him Ã”Ã‡Ã–Hyderabad consists of HI-Tech city developmentÃ”Ã‡Ã–. As well the same Hyderabad to KCR daughter Kavita say's its Charminar and Golconda ( source: published in all newspaper's Deccan Chronicle, The Hindu, Times of India), the entire family is very busy developing the urban spaces and forgot about the rural landscapes and people who are landless and small and medium peasants, tenets who brought them to power. Most importantly they betrayed tribal and Adavisis apart from the struggles of Polavaram project. Albeit the Telangana celebration are too high to overcome statehood mood matters. Firstly those who have come into political arena for first time seeking positions (New comers) and political giants who attained powerful positions. secondly those who jumped into TRS for post's, government busy schedule to categorizing position's for the kin and kith groups, family, caste, class, most importantly karyakartas. I do agree that the major concern in the Telangana region witnessing farm suicide but the Government does not have time to solve these problems. P.Sainath volumes on the farm Suicides talk about the foreseen increase rate of suicides after bifurcations clearly states the deteriorate status of Telangana to farmers and all migrants and landless population.